"The album that could and should have been," Ernst Jorgensen writes in the booklet accompanying FTD's latest effort Standing Room Only. And he's right. The decision to release Burning Love And Hits From His Movies Vol. 2 instead was both dumb and inexcusable. But 37 years later FTD aim to put things right. 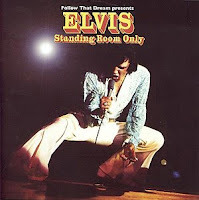 The label's version of Standing Room Only combines the Las Vegas masters from February 1972 with the studio masters recorded the following month. The second CD consists of outtakes from the March studio session. I for one like the idea of recreating albums that never came out, like Elvis Sings Memphis Tennessee and Standing Room Only. The packaging is first class, with a nicely written text that gives us the story behind the abandoned project (where the reasoning is very similar to my speculations nearly three months ago). What irritates me is that the content of the original album file recently found isn't shown properly in the booklet, but all over the place on pages 6 and 7. Unfortunately, this is often the case when it comes to documents being reproduced in booklets from FTD, and it's annoying. "The original album file reveals many treasures," says the photo legend on page 14. Well then, show us these treasures in their complete form; fully displayed and readable. Another strange thing with the booklet is that nearly all of the pictures are live shots from April 1972. Why wasn't more photos from March 1972 used as well as stills from February? Strange, indeed. When it comes to the contents on disc 1, we've heard the live material on many releases over the last 15 years. First they were issued on The Essential 70's Masters, then on Burning Love and finally on the Live In Las Vegas box set. Still, combining them with the studio material makes for great listening, and I agree with the liner notes that states that the album, if released in 1972, would've provided "a current statement of Elvis and his music" and that it "reminds us where Elvis was at musically in the spring of 1972." That feeling, unfortunately, vanishes when you reach the bonus songs also recorded live February 1972. Most of them are throwaways, like a sloppy "All Shook Up" and an uninspired "Teddy Bear"/"Don't Be Cruel" medley. The exception being "A Big Hunk O' Love," that I thought was intended for the original album, so why it's listed as a bonus song is anybodies guess. And returning to strange things, why are so many of the live tracks on disc 1 being faded out so quickly after the ending? "Hound Dog" even starts to fade out during the last notes of the song! Moving on to the studio outtakes on the second disc, I found them enjoyable to listen to and it's nice to have them all in one place. As you might know, a lot of the outtakes have already been released, the majority on the box set Platinum: A Life In Music and the FTD album 6363 Sunset. Actually, I count only two "new" complete outtakes, they being "Where Do I Go From Here" (take 2) and "Always On My Mind" (take 4). All the rest of the "previously unreleased" outtakes are incomplete, but at times interesting, nevertheless. My favorite part of the disc is all the takes Elvis spends on "Separate Ways," looking for the right phrasing and tempo of the song. It's obvious the song holds an emotional meaning to Elvis, but at the same time he seems to be in a good mood, lauging along with the band when mistakes are made, for example when he mispronounces the word "realise" in "And it's not to late to realise our mistake." Conclusion: If you're looking for a lot of unreleased material, you should probably leave Standing Room Only alone. On the other hand, if you've always been curious about "the album that could and should have been" this is an essential buy. Your choice.